The day I have been waiting for is finally here! Today, A&E Networks announced “The Employables.” For the past year and a half, I have been filmed for this series. A crew from Optomen Productions has come down to Alabama from New York City to film me. And soon, all of you will get to see the results! So, what is “The Employables” all about? It’s a new docuseries following struggling job seekers with conditions such as autism or Tourette Syndrome as they search for meaningful employment. With the help of specialists, each job seeker uncovers their talents and works to show potential employers that their perceived disabilities can often provide unexpected benefits in the workplace. Each one-hour episode of “The Employables” follows two neuro-diverse job seekers as they work to overcome obstacles and find fulfilling employment that provides them with the skills to excel long-term in their careers. Each participant works with an autism or Tourette Syndrome specialist to identify their strengths and determine how best to pursue their job search. Once they understand their talents, each job seeker sets out on interviews or trial runs with potential employers to find the perfect line of work. In addition to following the job seekers, the series also shines a light on the highs and lows that their friends and family have experienced as they support them in their goals. A&E will be providing information online and via social media about organizations that offer programs and resources for neuro-diverse individuals and their families. Here is the first promo for “The Employables”! As of the writing of this post, I do not know when my episode will air, yet. “The Employables” will premiere on A&E on Wednesday, May 15th at 9 pm Central. So, what will be happening with me to celebrate this major achievement? There will be a lot of things happening between now and the airing of the episode with myself in it. I wanted to rundown some of the things I will be doing to get ready for this new show! I have already guaranteed a few media interviews. There is a show on TV 24 called “Local Matters”, and the host has already agreed to a show about “The Employables.” I am also guaranteed an interview on the 97.9 WVOK radio show “Steve and Julie.” I am hoping to get a few more interviews lined up on radio stations here in East Alabama and on the Birmingham TV stations. 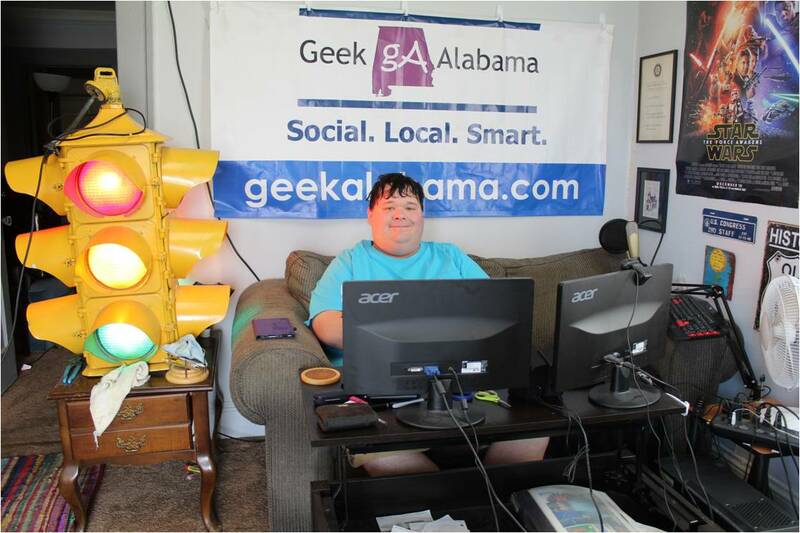 I am hoping to set up an interview with the FOX 6 morning show “Good Day Alabama.” Maybe I can set up an interview on the ABC 33/40 show “Talk of Alabama.” Maybe I can setup an interview on the “Rick and Bubba” radio show too? I will also be contacting The Anniston Star, Alabama Media Group (AL.com), and Alabama NewsCenter. Well, I need to get busy again. There are several events coming up and now I will be doing more coverage of them to showcase what I do. From the Noble Street Festival, Cheaha Challenge, Magic City Con, and more. You can bet I will be covering more stuff! Yep, I want to re-launch a few segments like my cooking segment and my vlog segments. I am wanting to also get into making gaming videos. You’ll see these segments coming to Geek Alabama! I will be watching all eight episodes in “The Employables” first season. I told the camera crew that I will be talking about my thoughts of the two people featured on each episode. No, I will not be talking negative, because myself and the other 15 people being featured have gone through a lot! I want to highlight these people and talk about what happened in their episodes. Man, I have a lot to talk about how the filming went. I will do a post talking about my thoughts about being filmed, how the process went, and the places we went. The camera crew really did enjoy some of the local restaurants we have here in Anniston, I will share my thoughts about that too. Of course, I will want to talk about what happened in my episode. I have not seen my episode yet, but of course I generally know how the episode will go, since I was the featured subject for one episode. I will be talking about everything from my thoughts, how they edited everything, and some behind-the-scenes stuff. For example, click the link to see how my “The Employables” trip to Boston and New York City went! Yes, I am hoping to set up a watch party when my episode airs! Of course, I need to find out when my episode airs, and find a venue, think I know of one already. I will announce details when I get everything together. I can not wait until the episode featuring myself airs on A&E! This is a very exciting moment for myself, and for the 15 other people being featured on season one of “The Employables.” I am hoping this series will get people talking about people with disabilities, like myself. Here in Alabama, we are almost dead last when it comes to employment for people with disabilities. I hope my episode will get a conservation going about how to fix this. And yes, I hope it involves meeting Alabama Governor Kay Ivey and state lawmakers. Get ready, the show is almost here!